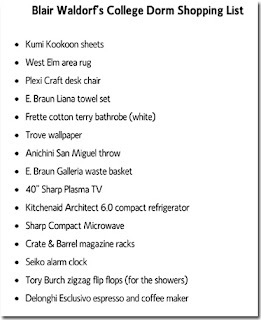 I'd like the things on this list for my condo, never mind a dorm room! Can't wait for tonight's episode! Wow it sounds like Blair nailed it! The perfect room! I can't wait to see it tonight! about ready to 'splode so I can see this episode! Ah, that's so great! My dream dorm would be plaid and navy and pink with all black and white photos...I kind of have that down, I guess! Can't wait for tonight's episode, of course! This is great Miss Nautical, they are so creative in promoting the show it is amazing. so cool!!! sounds amazing! can't wait for tonight! HA! that is so funny- Yesterday I posted my dream dorm room and I didn't even see this post- Go on over to my blog for a look! OMG I loved tonights episode just hate that I have to wait a whole week for another one! I LOVED my room in the sorority house sophomore year, I had the cherry duvet covers from pottery barn and red and white gingham dust ruffles, pillows, sheets, etc. White towels w/ red monogram. Lots of Chi O items all around. This was back in 2000 so there weren't any flat screen tv's, haha we all still had vcr's instead of dvd players. On the campus where I went to school there were old dorms and new dorms. I lived ina newer style (1960s) dorm room. I always wished I'd gotten into one of the older ones. There were so beautiful and very preppy feeling. I'd have decorated in plaid!